Sascha is a well-loved pre and post natal teacher here at Yoga West. 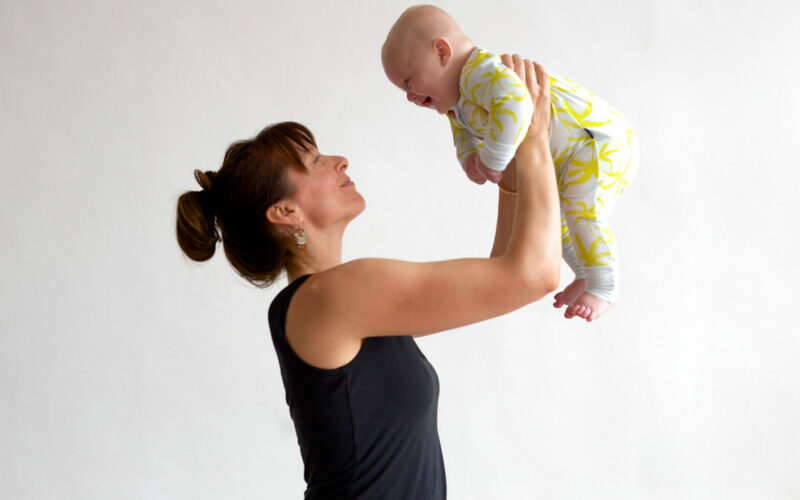 We thought we’d ask her a little bit about her own experience of returning to yoga via post-natal classes and why she thinks new mums should practice post-natal yoga. You can join these classes on Wednesdays and Fridays, 10:55-11:55. Why were you drawn to teaching postnatal yoga? Firstly because I got so much benefit from these classes when my first son was a baby and I simply wanted to pass that on. Secondly, it keeps me on my toes; no two classes are the same because the babies really dictate the flow of the class, for example there might be loud crying for many minutes followed by moments of complete contentment where the babies sit or lie awake in front of their mum or dad’s mat and observe their practice. Both of these moments represent the integrity of yoga, the loud and soft, the yin and yang of a practice. Lastly, it feels meaningful to me. To teach parents and babies yoga is joyful because these are people that recognise the full worth of the peaceful moments they encounter in their practice, of any extra energy they recover and of any softening in their musculature. What are the benefits for new mothers of attending postnatal yoga? Physically: slowly rebuilding muscular strength after the hormones of pregnancy have softened ligaments and tissues. Rebuilding strength in the pelvic floor. Stretching areas that become tight due to feeding and carrying a baby, for example, the shoulders and neck. Mentally: these classes work with your body as it is now, not pre-pregnancy. They focus on recovering strength and regaining energy. The breathing exercises help you to remain calm during the challenges of parenthood and the lack of sleep that many experience. Emotionally: Motherhood can turn familiar routines into beautiful (and distracting) chaos. If you are trying to practice control of this situation you may become very tired and a tad disgruntled. As much as you can, embrace this opportunity to let go of the familiar. These classes are a shared space with fellow parents, and that shared experience can go along way in helping you understand that the intensity of parenthood, the ups and downs, simply make us more connected. And that it’s ok to just be present in this experience of chaos, raw love and tiredness. Or to aim for that presence at least! This shared experience is, to me, the ultimate reminder of what a yoga practice can give us…equilibrium and a sense of greater purpose. What was your experience of attending the classes after the birth of your first and second child? I was very keen to attend classes after my first son was born. I remember asking if I could come along at 5 weeks (instead of the recommended 6 weeks+) but I was rightly reminded that resting is part of the process too. I would take my son every week to at least one class and I would structure our day around that class because it was so important to me. During some practices I had lots of energy and in others I would just take it easy but I always enjoyed chatting to the other mums and the community aspect was equally as important. Typically, I’ve had less time with my second son to attend classes but wow, when I do I’m reminded of just how beneficial it is. Once I’m there I am able to do some of my own practice and then spend these precious moments looking at my little son, instead of rushing around, and getting to listen to his gurgle-y giggles as he is lifted up during a song and is swung gently on my shins during ‘baby flyer’. He enjoys it so much, and is very interested in the other babies around him. These are moments imprinted in my memory. More generally, what is your advice (do’s and dont’s) to new mums on returning to regular physical activity and regain strength and fitness after giving birth? The first thing I highly recommend is to visit an osteopath around 6 weeks after giving birth, before doing any physical activity. Having just carried and birthed a baby is an intense physical experience and because hormones have softened the muscles, joints and ligaments (particularly in the pelvis) these stabilising forces might not be as supportive post natally (and therefore more injury-prone). It makes sense to have a professional check the structure of your body before you start to exercise again. Also, if there is an issue that is bothering you (pelvic floor for example) don’t just ignore it; speak with a health care professional until you get good advice or assistance. A big ‘don’t’ is to put pressure on yourself to be in a certain physical shape or particular weight within an unrealistic time frame. Certain functions will naturally assist weight loss such as breastfeeding and loosing water through night sweats in those early weeks. Try to keep, maintain or build your energy rather than give it out to strenuous exercise. Eat and drink energy-building substances and make this a priority. Know and understand your own body’s requirements rather the person on the mat next to you who may have had a completely different experience of pregnancy and birthing to you. Overall, work from the inside out. By that I mean gently strengthening your pelvic floor, core and emotional body before you put emphasis on your external appearance. Any top tips you can share with new mums? Your environment: There are two things I suggest and I’m sure they’re subjective but I absolutely recommend having a shower as early as you can in the day – water refreshes! And here is the controversial one – keep a clean household. Many will say to ignore the housework and sleep when your baby sleeps but for me this didn’t fit my needs. Having a consistently clean space means I know where things are and feel less overwhelmed when trying to get something done in a timely manner (babies aren’t known for their patience!). However, the caveat here is to not do this yourself all the time as resting is important. Ask your partner/mother/friend to help or maybe even hire someone for a couple of hours a week – whatever you can manage (some of these cleaning companies give out free trial vouchers too which can help and I like to pass these out in class). But the crux of this advice is to practice being kind to yourself because that is practicing yoga too! Your mind: Yoga is not just a physical practice. While the physical (asana) can be very grounding and useful, the mental aspects are equally if not more important when it comes to motherhood. When repetitiveness, tiredness and a simple desire to be getting something done arises when you are instead forced to sit and feed your baby for half an hour, here is where you have to confront the challenge. Being in the moment is easier said than done and actually takes practice. Only two days ago I found myself folding laundry when the baby wouldn’t stop crying. Ugh, I thought, why can’t I complete one single task? In that frustration I recognised what I needed to do…I lay on the floor with the baby, on his rug, and he stared at me and then began to make his contented little gurgling noises. Oh, connection I thought! This was what he was after, and it was a great reminder of how fulfilling that connection is. Much more than folding laundry. So, although you might mourn your pre-pregnancy yoga routine and attention span, now is the time to shine a light on the other parts of your practice, because this you can do every waking moment. Be present, breathe deeply. I like to find ways to incorporate poses into daily mama life (cot railing-assisted Warrior III anyone?). My motto was and is “do what you can, when you can”. On connection, don’t let every day evaporate without spending some time outdoors, sometimes with friends, and definitely sometimes with other mothers with young children. It reminds you that you are a collaborator in this project motherhood and that you are certainly not alone. Speak up if you feel otherwise.